Gregory B. Jaczko - Chairman of the U.S. Nuclear Regulatory Commission. Helen Caldicott, M.D. - The articulate and passionate advocate of citizen action to remedy our nuclear and environmental crises. Iouli Andreev - Former director of the Soviet Spetsatom clean-up agency following meltdown at Chernobyl. Michael Mariotte - Executive director and the chief spokesperson for the Nuclear Information and Resource Service. Investigation Committee on the Accident at the Fukushima Nuclear Power Stations - Established to conduct an investigation to determine the causes of the accident at Fukushima Daiichi and Daini Nuclear power stations of Tokyo Electric Power Company, and the damages generated by the accident, and to make policy proposals designed to prevent the recurrence of similar accidents in the future. National Diet of Japan Fukushima Nuclear Accident Independent Investigation Commission (NAIIC) - Established by the National Diet as the first independent investigation commission in the 66 years of Japan's constitutional government. Also see Wikipedia article. U.S. Nuclear Regulatory Commission - Japan nuclear accident actions and related activities and documents. Forecast for Plume's Path Is a Function of Wind and Weather - A forecast by the Comprehensive Nuclear Test Ban Treaty Organization shows how weather patterns this week [March 12-18, 2011] might disperse radiation from a continuous source in Fukushima, Japan. GE Nuclear Reactors in the U.S.
Map of 104 Nuclear Power Reactor Locations in U.S. (via McClatchy) - Twenty-three U.S. reactors are of the same Mark I design as the Japanese reactors hit by the earthquake and tsunami, a design whose safety risks were found to be so unacceptable by safety officials as long ago as 1972, that it was recommended they be discontinued. See 1972 [then Atomic Energy Commission] memo exchange here and here. Safecast - Attempting to display reliable radiation readings as they become available. 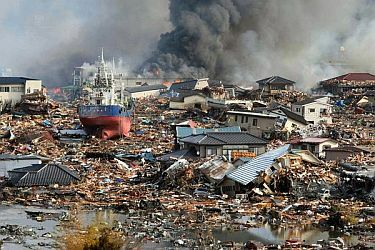 Tohoku Earthquake Tsunami Information - This site provides information following the 2011 Tohoku Pacific Ocean Tsunami, including surveys, satellite/aerial photos, Google Earth KML files, past tsunami records, estimates of damage and more. It is maintained by the Coastal Engineering Committee of the Japan Society of Civil Engineers. Wall Street Journal: Japan - Below are some of the WSJ's intearctive graphics. Radiation Levels in Japan - The Japanese government monitors radiation levels around the country. Track these measurements over time. View by location and date over time. Satellite Images Before and After - Compare satellite images before and after the earthquake and tsunami to see damage across Japan. Threat by Land and Sea - Dozens of nuclear reactors operate in earthquake-prone regions around the world. Among them, least 34 are in high-hazard areas; 17 of those are within a mile of a coastline. WSJ Interactive - Keeping track of reactor incidents at the Fukushima Daiichi nuclear plant 170 miles northeast of Tokyo. WP Interactive - A wave of destruction. WP Interactive - Tracking the crisis. World Nuclear News (WNN) - Supported administratively and with technical advice by the World Nuclear Association and based within its London Secretariat. Citizens' Nuclear Information Center - An anti-nuclear public interest organization dedicated to securing a safe, nuclear-free world. CNIC was established in 1975 in Tokyo to collect and analyze information related to nuclear energy including safety, economic, and proliferation issues and to conduct studies and research on such issues. Foratom - The Brussels-based trade association for the nuclear energy industry in Europe. Its main purpose is to promote the use of nuclear energy in Europe by representing the interests of this important and multi-faceted industrial sector. GE Advanced Reactor Technologies (corporate page) - Vendor for jeopardized nuclear reactors in Japan. IAEA Update on Japan Earthquake - Providing regular informative updates, including graphics, story resources, briefings. Nuclear Energy Institute (NEI) - Policy organization for the nuclear technologies industry. OECD NEA: Nuclear Energy Agency - A specialised agency within the Organisation for Economic Co-operation and Development (OECD), an intergovernmental organisation of industrialised countries based in Paris, France. RadNet Laboratory Japanese Nuclear Emergency: Radiation Monitoring in U.S.
Japanese Nuclear Emergency: Radiation Monitoring in U.S.
Tokyo Electric Power Company (TEPCO) - Owner of jeopardized nuclear reactor plants in Japan. Fukushima Collective Evacuation Trial - Since the Fukushima Daiichi nuclear power plant accident in March 2011, the children in elementary and middle schools in the central areas of Koriyama City have had to attend schools in a dangerously contaminated environment. On June 24, 2011, 14 children in grade school in Koriyama filed a law suit against the City of Koriyama demanding their right to study in a safe environment. The Koriyama District Court dismissed the case on December 16, 2011. A formal objection is presently pending before the Sendai High Court. Fukushima Earthquake Moved Seafloor Half a Football Field - A Scientific American article by Mark Fischetti (12 Dec 2011). Japan Fast Trench Drilling Project (JFAST) - The main goal of the JFAST project is to understand the very large fault slip that occurred on the shallow portion of the subuction zone during the 2011 Tohoku earthquake. This large slip of 30 to 50 meters was the main source of the devastating tsunami that caused so much damage and loss of lives along the northeast coast of Honshu, Japan. In order to understand how the fault moved with such large displacement in this region, the JFAST project has two main objectives. The first is to sample the fault in order to analyze the physical properties of the fault zone. The second is to make temperature measurements to estimate the frictional stress during the earthquake. Links for People Working for a Nuclear Free World - Provided by the Citizens' Nuclear Information Center. This webpage last updated on Tuesday, August 16, 2016 2:26 PM.